Clark County is the fifth largest county in Washington with over 425,000 residents. It is located just across the Columbia River from Portland, Oregon, in the southwestern part of the state. Its largest city and county seat is Vancouver; naturally, it is included in the Portland-Vancouver-Hillsboro metro area. It has been one of Washington’s fastest growing counties in the recent past. The county is located between Mt. St. Helens and Mt. Hood National Forest and includes a small part of the Gifford-Pinchot National Forest. Cities over 5,000 people include Vancouver, Camas, Battle Ground, Washougal, Woodland, and Ridgefield. The southern portion of the county is quite urban and includes well-populated suburbs, but the northern majority remains fairly rural. 5 Beds | 3 Baths | 2592 sq. Ft.
4 Beds | 2.5 Baths | 2378 sq. Ft.
3 Beds | 2.5 Baths | 2159 sq. Ft.
3 Beds | 2 Baths | 1497 sq. Ft.
7 Beds | 4 Baths | 5603 sq. Ft.
5 Beds | 2.5 Baths | 2734 sq. Ft.
5 Beds | 3.5 Baths | 3500 sq. Ft.
3 Beds | 1.75 Baths | 1871 sq. Ft.
3 Beds | 2 Baths | 1210 sq. Ft.
4 Beds | 2317 sq. Ft.
5 Beds | 4 Baths | 3918 sq. Ft.
3 Beds | 2 Baths | 1476 sq. Ft.
3 Beds | 2 Baths | 1208 sq. Ft.
4 Beds | 3.5 Baths | 2605 sq. Ft.
5 Beds | 2.5 Baths | 2762 sq. Ft.
2 Beds | 2 Baths | 1360 sq. Ft.
3 Beds | 1.75 Baths | 2138 sq. 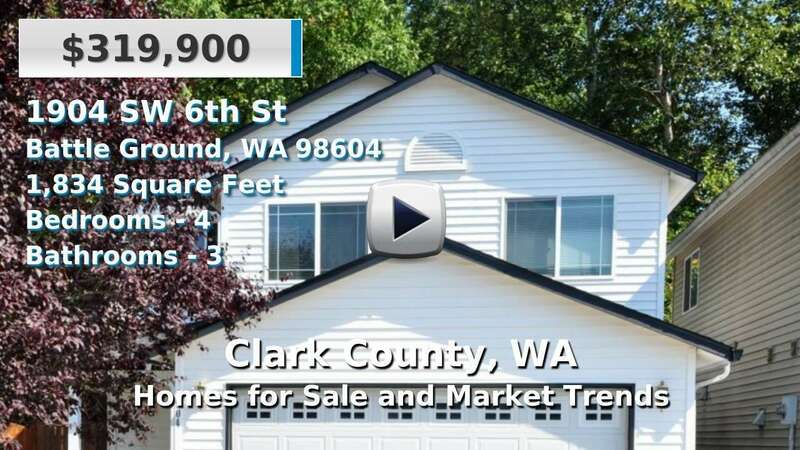 Ft.
Blue Summit Realty has the most accurate and up to date Clark County real estate listings on the web. Currently there are 149 homes for sale, 4 condos for sale, and 93 vacant land properties in Clark County. Of the 250 total Clark County residential listings for sale 6 are bank owned, 1 are short sales and 24 are new construction and 0 are townhomes. The price ranges from $99,950 to $12,000,000 with a median list price of $486,465 and median sold price of $378,881. Make sure to refine your Clark County real estate search by property type, price, square footage, bedrooms, bathrooms and more with the search tool above or view the Clark County listings on our interactive map. Our Clark County real estate listings were updated 6 minutes ago.